Virtual Album of Virtual quilts. Each album will contain 5 to 10 designs, usually from early in the series. To see more of each series use tags or categories in the right hand column. The pages are a work in progress, but hopefully they will gradually catch up. 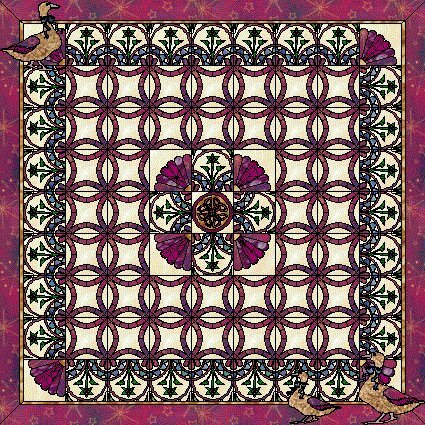 The design shown above was one of the first quilts I designed in Electric Quilt 5, and the first design added to the Virtual Quilter’s weblog. I really like your stuff, my favorite is in the EQ6 9 X 9 series the 2nd quilt. That 9-Patch with the half square triangle that makes the block look like a ribbon twist is great. I love the secondary pattern the blocks position makes. Thanks for sharing. I just found your blog today but it looks like one I want to come back too often. Isn’t that twisted ribbon effect great! Such a simple block which relies totally on fabric placement to give that effect. I love this series ….. there are some dull quilts, but most are more than intersting. Glad you enjoyed the visit, and look forward to return visits. Well, thank you so much for sharing! I just love everything you’ve done.